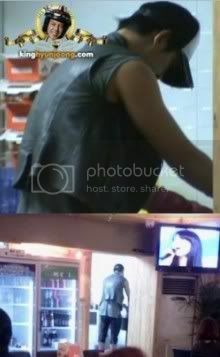 It seems Hyun Joong did the dishes for 20 minutes at his chicken restaurant on the 15th. Hyun Joong ! My dearlil'urchin boy....he knows that washing dishes is OK !! Besides, he did work in a chicken restaurant before he debuted with SS501, right ?....musta had a lot of experience in washing, serving and cleaning. He must have wanted to help the staff there. Hm...this endears him to me more :) lots of girls who complains when they have to wash dishes are now having second thoughts...kekeke. Leader Fightiing ! Photo credit as labeled and Allkpop.